Zucchini season is upon us, and neighbors often drop by with harvested zucchini and yellow squash to share. 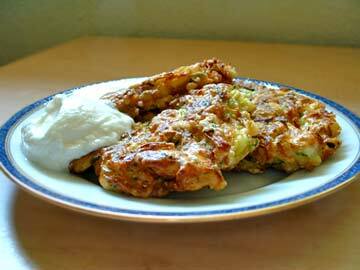 Here is a favorite recipe for zucchini fritters, which look a lot like potato latkes, except without the potato. A tasty, easy option if you are trying to get your kids to eat more veggies and use the bounty of your garden too. Plain yogurt works just as well as a condiment with these as sour cream. 2 Whisk egg in a large bowl; add the zucchini, flour, cheese, baking soda, spices, scallions, and 1/4 teaspoon of pepper. Mix to combine well. 3 Heat oil in a large skillet over medium heat. Cook fritters in two batches. Drop six mounds of batter (2 Tbsp each) into the skillet. Flatten slightly. Cook turning once until browned, about 3 minutes on each side. Transfer to a paper towel-lined plate. Sprinkle with salt. Repeat with remaining batter. Serve immediately, with sour cream or plain yogurt on the side. Makes 6 fritters. add a slice of fresh mozzarella cheese topped with a slice of fresh tomato. Add a spice of your choice to the sour cream or yogurt for variety. I like a little curry or dill.